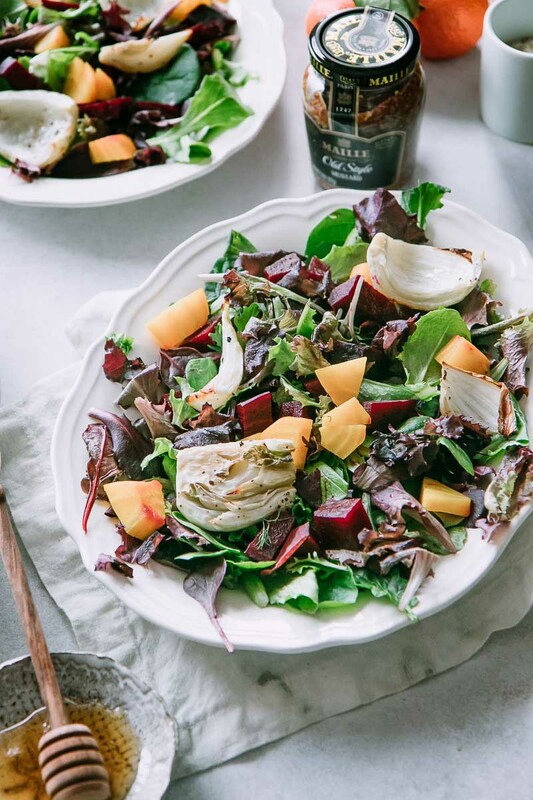 Roasted Fennel Beet Salad with Honey Mustard Vinaigrette, a simple roasted winter vegetable salad with red and golden beets, fennel, shallots, and a homemade honey mustard vinaigrette using Maille Old Style Mustard. This post is sponsored by Maille, however all opinions are my own. See our Disclosure Statement for more info on sponsored content. You know that time of winter when you can’t take one more soup or stew and you just need vegetables? I hear you. Winter isn’t exactly known for its selection of fresh vegetables, but I’m here to show you that you CAN get your healthy vegetable fix with the cold weather harvest. Enter the roasted vegetable salad: a simple salad of sheet pan-roasted root vegetables like beets and fennel and tossed with greens. Simple to make, great for leftovers, and versatile enough to be a main dish or an easy side for your hearty cold weather comfort meals. Just add a homemade dressing and you have yourself a hearty and healthy new winter favorite. That’s why I’m teaming up with Maille Mustard to show that winter produce doesn’t have to be boring! Cooking from scratch throughout the cold weather season just means getting creative with your sauces and seasonings, and my favorite way to spice up a simple salad is to make my own honey mustard vinaigrette using Maille Old Style Mustard for a flavorful kick. Want the recipe for my favorite take on winter vegetable salads? 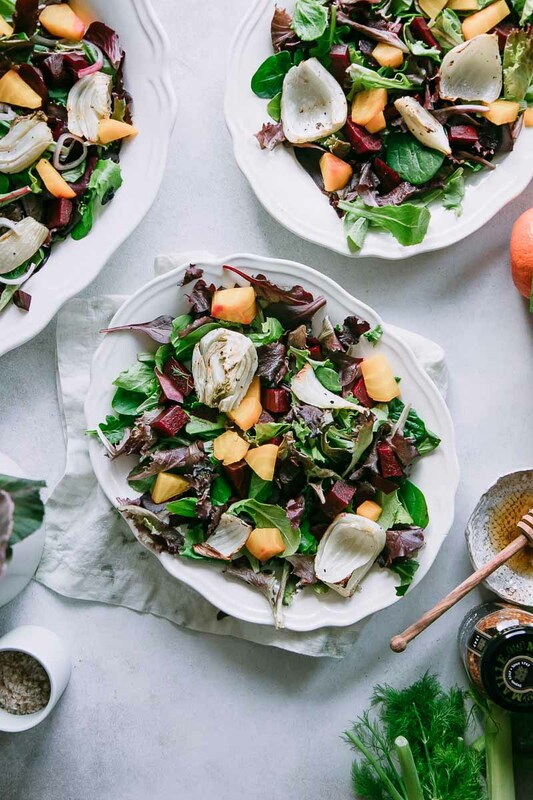 This simple Roasted Fennel Beet Salad with Homemade Honey Mustard Vinaigrette is ready in under an hour and is great for meal prep and leftovers. Making your own salad dressing is a simple way to go green in the kitchen! Not only are they super versatile and easy to make, but making your own dressings instead of buying premade dressings is a great way to reduce packaging waste. Win, win! My go-to homemade salad dressings ALWAYS includes a bit of stone ground mustard like Maille Old Style Mustard. 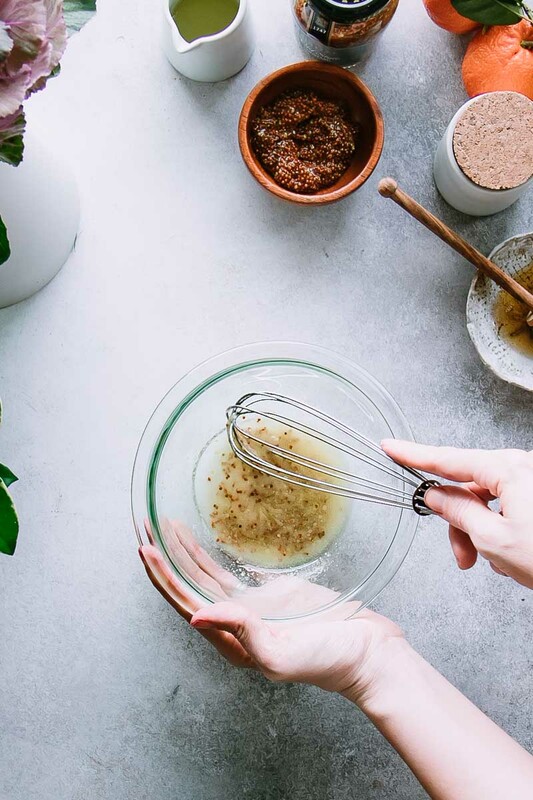 Mustard contains lecithin, which is a natural emulsifier and will help your olive oil and vinegar-based dressings combine and mix easily without separation. Whipping up your own dressing is simple, test your favorite combinations based on what’s fresh and in-season! 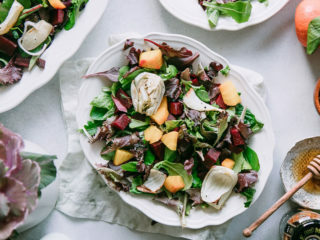 This simple roasted vegetable salad recipe with homemade dressing is as easy as roasting vegetables, tossing them with greens, and then topping with homemade dressing. 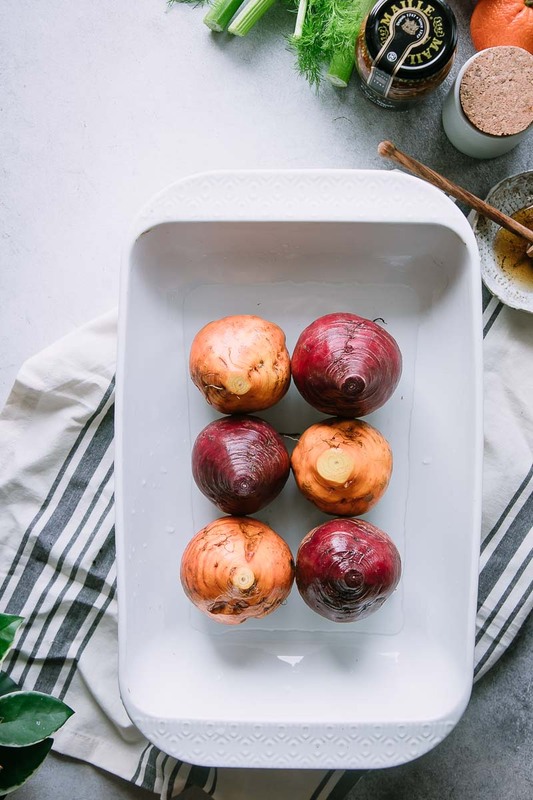 First, preheat your oven and place beets in a small layer of water in a glass baking dish and cover with aluminum foil so they steam while baking. Bake until they are soft and a fork can easily spear through the beets, about 40 minutes total. When finished let the beets cool and then peel and cut into small cubes. Meanwhile, trim and core the fennel (see this video on how to cut a fennel bulb) and toss with a bit of olive oil and sea salt and place in a small glass baking dish. Roasted the fennel in the oven with the beets until they are soft and golden brown, about 30 minutes. When finished let the fennel cool. 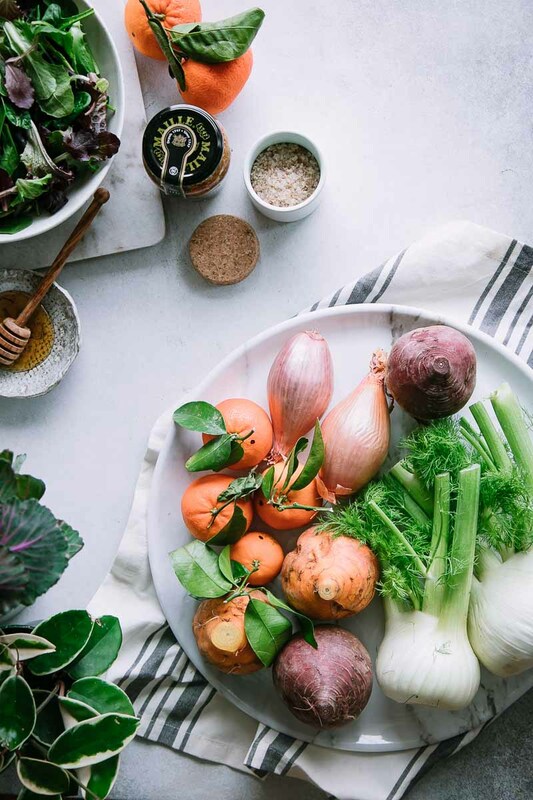 To make the homemade honey mustard vinaigrette, combine olive oil, a splash of apple cider vinegar, Maille Old Style Mustard, honey, the juice of one orange, and a pinch of salt and pepper in a small glass mixing bowl. Whisk until the dressing is well combined and does not separate, about 60-90 seconds. Now it’s time to put it all together! Layer the roasted beets and fennel on top of a bed of mixed greens and top with sliced shallots. Then add a drizzle of homemade honey mustard vinaigrette, toss to combine, and enjoy! Love this simple roasted winter vegetable salad recipe? Check out our other seasonal salad recipes, like this Butternut Squash Cranberry Kale Salad. Did you make this Roasted Fennel Beet Salad? Leave a comment below and rate the recipe to let us know how it turned out. Save this winter salad recipe for later by pinning to your favorite winter Pinterest board and make sure to tag me on Fork in the Road’s Instagram to show me your homemade salad dressing creations! 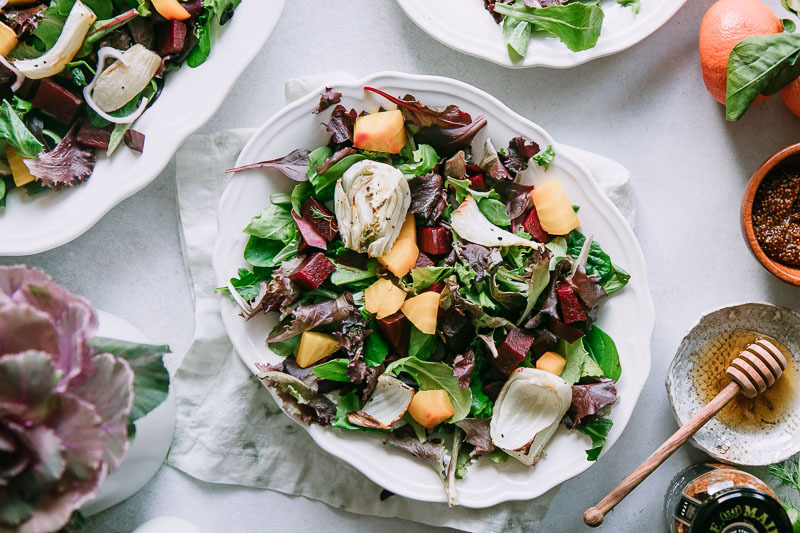 Roasted Fennel Beet Salad with Honey Mustard Vinaigrette, a simple roasted winter vegetable salad with red and golden beets, fennel, shallots, and a homemade honey mustard vinaigrette. To roast beets: wash beets and place in a large glass baking dish filled with a small layer of water. Cover with aluminum foil and bake until soft and a fork can easily spear through, about 40 minutes. Let cool and sliced into cubes. To roast fennel: toss trimmed and cored fennel with olive oil and sea salt, then bake in a glass baking dish until soft and golden brown, about 30 minutes. Let cool. To build salad: arrange mixed greens, cooled beets and fennel, and shallot slices on a plate. Toss with Homemade Honey Mustard Vinaigrette (see recipe below). Combine olive oil, apple cider vinegar, honey, Maille Old Style Mustard, juice of one orange, and a pinch of salt and pepper in a small glass mixing bowl. Whisk until well combined and toss with salad. Nutrition notes: this recipe is completely plant-based and features many vegetables that are easily found in winter months. 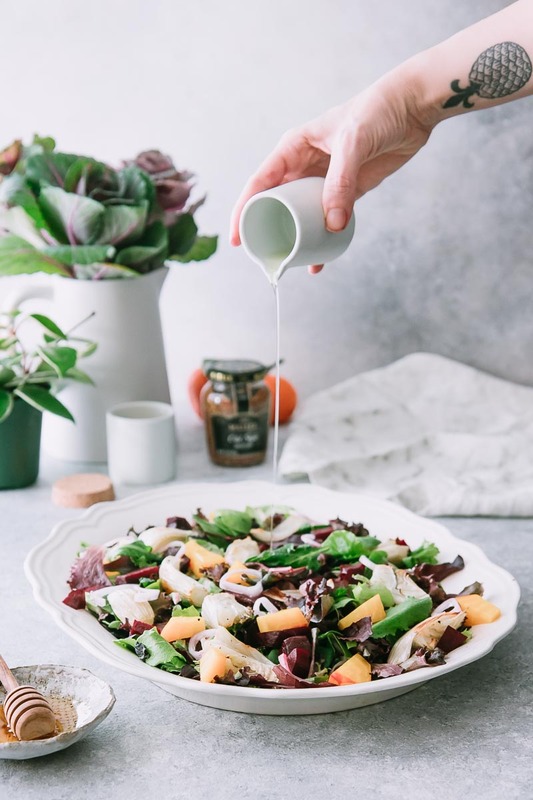 It is high in fiber, potassium, and plant-based protein and features mustard as an emulsifier, which binds together the homemade honey mustard vinaigrette.